This print is not listed in Pousette-Dart, but I wonder if it might be catalogued as Pine Study. The plate size and description match. If so, the edition size is 10. The catalogue doesn’t mention signature, but the print is signed in the plate just left of center at the bottom. It is pencil signed in the center. The catalogue mentions that the branches are unfinished, but this print seems to be finished, so if it is related, it may represent the completed edition. 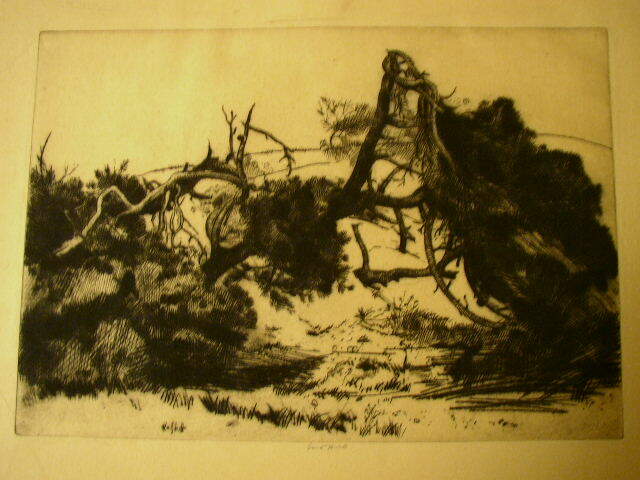 It’s a fantastic drypoint, great burr, crisp impression and well inked. Very thin paper, but in excellent shape. Thin paper. Some slight creasing of the upper portion of the sheet. This does not involve the image. There is a small crease lower left that must have been present at the time of printing, as there is corresponding ink loss about 3mm in length at the lower left margin. Mounted with Japanese hinge tape and covered with glassine protector.